The world over frauds are an integral part of economic and financial activity. Trillions of dollars have been lost to market manipulation, insider trading, marshaled accounts, and above all, human greed. In the 1987 American film, Wall Street, Gordon Gekko, a Machiavellian businessman, mouths that, "Greed, for lack of a better word, is good". Today, Gekko's credo seems to have become a byword for corporate greed and excess. Recently I found this terrific infographic on the Credit Blog. In terms of length and size, it is the single biggest infographic I have ever seen; it is also one of the best. It is titled 'Too Big to Fail' - a favourite slogan of the U.S. government officials and Wall Street executives, designed to extract a trillion dollar bailout for beleaguered and bankrupt large American business entities. 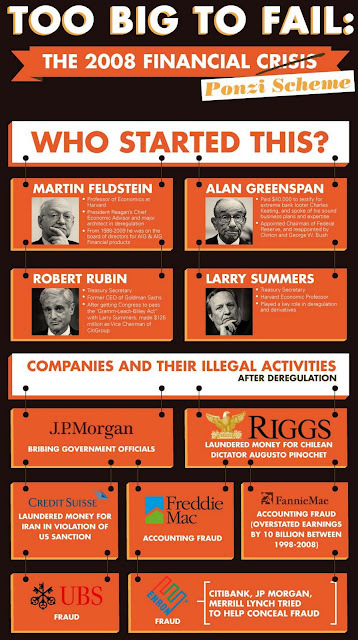 It details the backgrounders to some of the most serious financial frauds and crises that Corporate America has witnessed (like the 2008 Financial Crisis and the 2000 Dotcom Bust); why and how they happened, the names of prominent players, and how these crises have almost brought down the U.S. economy. If you wish to learn more, click here for the complete infographic. Open the infographic in a new tab / window; double click on the infographic for a larger picture. Labels: Business, Corruption, Economics, Infographic, Technology, U.S.